The army would maintain "peace, order and security" across Sudan during an already announced transition period that would last at most two years until elections could be and civilian rule introduced, he added. Using a more conciliatory tone, Gen Burhan also called on the opposition to "help us restore normal life", promised to try those who killed demonstrators and vowed a war on corruption. Known by the nickname "Hemeti", the general commands the paramilitary Rapid Support Force (RSF), which grew out of the government-backed Janjaweed militia. The Janjaweed are accused of carrying out atrocities in the western region of Darfur in the early 2000s. Opposition groups have met the military to discuss "transitional arrangements". And according to the privately-owned Baj News website the leader of the opposition Sudanese Congress Party, Omar el-Digeir, said representatives had demanded a civilian government with "full executive powers" and a role for civilians during the transition. The Sudan Professionals Association (SPA), which has been spearheading the demonstrations, said the council's response "did not achieve any of the demands of the people" and urged protests to continue. Protestors have called for the abolition of "arbitrary decisions by leaders that do not represent the people" and the detention of "all symbols of the former regime who were involved in crimes against the people". The momentum is clearly with the protesters. They have forced out two powerful generals in just a matter of days. 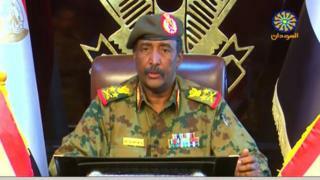 NISS, which Gen Gosh headed, exemplified the ruthlessness of security forces under Mr Bashir's regime. And interestingly soon after Gen Gosh's resignation was announced, the SPA released the names of its negotiating team. In the past they said they would not publish any names for fear they would be targeted. The fact that they can do so now suggests there could be room for talks with the military council. What next for Sudan's 'master manipulator'?